In the American Bobtail cat, a spotted or ticked (having four to twenty bands of color on each hair.) brown tabby pattern is dominant. All colors and patterns are accepted for show, including points with or without markings and preference is given to colors and patterns that enhance the natural wild appearance of the breed. Grooming requirements are minimal. This cat’s beautiful coat comes in both a medium, semi-dense shorthair and a medium-length longhair that is resilient and resistant to water. Whether medium or long, coat does not mat. Only an occasional shampoo is needed. Very loving and gentle, the American Bobtail is also playful, patient, curious and accepts training easily. These are good natured, incredibly intelligent cats. Great with families and children in particular, these cats don’t mind being carried about by kids. According to the CFA, they are noted for their dog like personalities and their devotion to their owners. 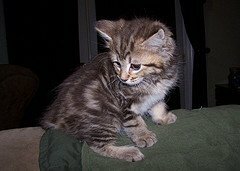 The American Bobtail is a medium-to-large, naturally bobtailed cat. Strong and athletic, this breed has a short tail though the length may vary between 1-6 inches in length. One should be able to see the tail above the back when the cat is alert, but it should not exceed the hock in length. This cat has a wedge-shaped head, a rather prominent brow and large, semi-almond shaped eyes. These wonderful companions easily adapt to almost any environment. They form strong bonds with their family. They seem to like most dogs and welcome new additions to the family, human or not. This is a slow maturing breed taking two to three years to reach full adult type. For a family friendly, loyal, clean companion, the American Bobtail is a very good choice.